Prominent in the baseball circles of his time but now forgotten, Bill Watkins spent more than 30 years as a player, manager, front-office executive, and owner of various major and high-minor-league teams. His playing career short-circuited by a near-fatal beaning in 1884, Watkins thereafter assumed the manager’s post for the Detroit Wolverines and within three years transformed that National League doormat into the baseball world champions of 1887. During his heyday, however, Watkins was most often associated with Indianapolis, serving no fewer than eight baseball organizations established in the Indiana capital. Finally leaving the diamond scene in the early 1920s, Watkins – a Canadian by birth – spent his remaining years as the leading citizen of Marysville, Michigan, a community about 60 miles northeast of Detroit that Watkins himself helped to found. The long and productive life of William Henry Watkins began in Brantford, Ontario, on May 5, 1858. He was the oldest of the three children surviving to adulthood born to John Harton Watkins, a farmer turned prosperous dry-goods merchant, and his wife, the former Eliza Jane Tyler.1 Both parents were immigrants, brought to Canada as children from Wales (John) and Ireland (Eliza), respectively. Bill’s youth was unsettled by the untimely death of his mother in 1868. He was then sent to the rural enclave of Erin, Ontario, to be raised by his maternal grandparents.2 Bright and with mechanical aptitude, Watkins was educated at local prep schools and then spent a year at Upper Canada College, a prestigious postgraduate school in Toronto. During his school years, Watkins was introduced to baseball, and his interest in the game developed as he began his working life as an apprentice in a novelty-machine manufacturing plant. Thereafter, he was employed by a Canadian branch of the Ingles-Corliss Engine Works.3 Watkins emigrated to the US in 1879, taking up residence in Port Huron, Michigan, which he would call home for the next 40 years. Demonstrating leadership qualities from an early age, Watkins began his baseball career in 1880 as the youthful playing manager of the Maple Leafs of Guelph, Ontario, a nearby semipro nine.4 The following year, he moved up a competitive notch, steering the St. Thomas Atlantics, one of Canada’s top semipro clubs. Thereafter, Watkins took command of his new hometown’s side, piloting the Port Huron club to the Michigan State League championship in 1882 and 1883. He then entered the professional ranks, taking the post of second baseman-manager of Bay City in the Northwestern League. Watkins had his latest team in pennant contention (39-16) when financial difficulties precipitated the dissolution of the Bay City franchise in early July 1884. Despite posting only a .234 batting average, Watkins had caught the eye of those in charge of even faster competition, preserving his career in baseball. With three professional operations – National League, American Association, and Union Association – all claiming major-league status, the 1884 season supplied ample employment opportunities for unattached ballplayers, even those with only marginal playing ability. Bill Watkins, now 26, was among their number. In late July he signed a contract to play for the woeful Indianapolis Hoosiers of the American Association. Then a lean 5-feet-10 and 156 pounds, the right-handed Watkins5 was immediately inserted into the Hoosier lineup at third base and went 1-for-4 in his major-league debut, a 7-6 loss to Columbus on August 1. Ten days later, the rookie infielder was given charge of Indianapolis fortunes, replacing Jim Gifford at the helm of the 25-60, 11th-place (out of 12) team. Once in charge, Watkins switched himself to second base and “played his position nicely.”6 He also began to show some pop at the plate, going 9-for-23 (.391) over a six-game stretch. On August 26, however, an errant first-inning fastball thrown by Cincinnati fireballer Gus Shallix effectively ended the playing career, and almost took the life, of Bill Watkins. Struck squarely in the head by the pitch, Watkins spent the next several days in and out of a coma before recovering.7 On September 11 Watkins was able to place himself back in the Hoosiers’ lineup, going 2-for-4 at the plate while handling six chances cleanly at second base. But it soon became obvious that he was not the player he had been before the beaning. In his last 12 games, Watkins went 3-for-37 (.081) with the bat and played erratically in the field. And by season’s end, Watkins had benched himself. The Hoosiers joined their skipper in the performance tailspin, losing their last 13 games in a row and finalizing the Watkins managerial log at a dismal 4-18 for the 11th-place Indianapolis club.8 That fall the American Association dropped the Indianapolis franchise. Like the defunct Hoosiers, Bill Watkins never played another major-league game. In his 192 lifetime plate appearances, he had batted an anemic .205, with only four extra-base hits. In the field he had been no better, posting a substandard .878 fielding percentage at second, third, and shortstop (two games). But if Watkins’ ballplaying career was behind him at an early age, two lifelong endeavors beckoned. On November 6, 1884, Watkins married Edna Buzzard, the daughter of a Port Huron sea captain. The marriage would endure for 52 years, but apparently without children. Three months after marrying, Watkins commenced his tenure as a full-time baseball executive, joining Ted Sullivan, Tom Loftus, and George Tebeau in organizing the Western League, a new minor-league circuit composed of teams located in six midsized Midwestern cities. Watkins himself took command of the league’s Indianapolis entry, a team that retained the Hoosiers nickname but otherwise bore little resemblance to its hapless American Association forebears. This new Indianapolis nine quickly took a commanding lead in the inaugural Western League pennant chase. But on July 6, 1885, the first-place (27-4) Hoosiers franchise failed financially, precipitating the immediate demise of the new league. Shortly thereafter, the assets of the Indianapolis franchise, including the contracts of manager Watkins and star outfielder Sam Thompson, were purchased by the Detroit Wolverines of the National League. With Detroit (18-39) out of pennant contention, Watkins replaced Charlie Morton as the Wolverines’ manager. In keeping with 19th-century norms, on-field decisions – batting order, defensive alignment, in-game stratagems, and the like – remained the province of Wolverines team captain and center fielder Ned Hanlon. Watkins would serve as a one-man front office, attending to administrative chores like player acquisition, traveling and hotel accommodations, collection of gate receipts, and the scheduling of exhibition games, an important revenue source for the financially shaky Detroit franchise. Watkins, something of a martinet as a younger man, also attended to team discipline, doling out $10 fines for shoddy play in the field and leveling more substantial penalties for late-night carousing, a common player pastime that Watkins could not abide.9 Under the Watkins regime, the Wolverines made some progress, finishing the 1885 campaign at 41-67 and positioned for advancement in the league standings. The 1886 season proved an eventful one for Watkins. The previous winter a pharmaceutical manufacturer and sportsman, Frederick K. Stearns, had assumed the presidency of the Detroit club and was determined to transform the Wolverines into a championship nine. To that end, Stearns purchased the bankrupt Buffalo franchise and with it the contracts of the club’s famed Big Four: Dan Brouthers, Deacon White, Hardy Richardson, and Jack Rowe. Once in uniform, the group elevated Detroit into an immediate pennant contender. Then, at midseason, Watkins came to terms with crack second baseman Fred Dunlap, late of the St. Louis Maroons – the first in a series of events that would earn Watkins the enmity of Mound City partisans.10 Paced by the offense supplied by Brouthers (.370), Richardson (.351), and Sam Thompson (.310), and with Lady (Charles) Baldwin and Charlie Getzien combing for 72 wins from the pitcher’s box, the Wolverines’ record skyrocketed to 87-36. But that sterling performance was good only for second place, three games to the rear of the National League pennant-winning Chicago White Stockings of Anson/Kelly/Clarkson fame. Notwithstanding the team’s success, there was dissension in the Detroit clubhouse, with the disciplinary measures of manager Watkins being a sore point. Particularly resented was Watkins’ tendency to fine lesser lights like catcher Fat Briody and pitcher Stump Weidman for infractions that went unpunished when committed by team stars.11 This prompted the new St. Louis baseball weekly, The Sporting News, to describe Watkins as “more disgusting to the [Detroit] players than Anson is to the Chicago giants.”12 Then in November 1886, controversy attended Watkins’ attendance at the American Association winter meeting, a gathering focused on the crisis created by the Pittsburgh club’s jump to the National League. At first Watkins played it coy, neither confirming nor denying Detroit’s interest in transferring to the American Association. Thereafter, following long-distance consultation with Wolverines president Stearns, Watkins announced that the National League had granted concessions sought by the Detroit club and withdrew himself from the American Association conclave. This proved too much for The Sporting News, still angry over the Dunlap signing and other perceived Watkins designs against the Maroons. In a series of December 1886 editorials, the newspaper blistered Windy Hawfulgall Watkins as a “peddler of franchises” and an “ill-mannered boor” intent upon undermining the good standing of the St. Louis club in NL councils.13 But while A.H. Spink and Company were denouncing Watkins, the Maroons franchise was being targeted for acquisition by a different menace, a consortium of Indianapolis businessmen led by department store owner John T. Brush. Early in 1887 the Brush group acquired the St. Louis franchise and transferred it to Indianapolis for the coming season. With that development, The Sporting News tempered its rhetoric about Watkins. The 1887 season would prove the highlight of the Detroit Wolverines’ existence, and of Bill Watkins’ tenure as a major-league executive. After a six-week spring-training sojourn in Macon, Georgia,14 the Wolverines got off fast in the pennant chase and were never headed, the team dynamic improved by the voluntary withdrawal of the caustic-tongued Watkins from the Wolverines bench during games.15 With Sam Thompson (.372, with a league-leading 166 RBIs) ably supported by Brouthers, Richardson, White, and Rowe, all of whom hit over .300, and a five-man pitching staff led by 29-game winner Getzein, the Wolverines captured the pennant with a handsome 79-45 log. Detroit then attained the title of baseball world champion, defeating the American Association standard-bearing St. Louis Browns in a 15-game match, played to conclusion in ten different cities before ever smaller galleries.16 But even a world championship title could not cure the financial ills of the Detroit franchise. With its population then under 150,000, Detroit proved unable to draw large crowds at home. National League owners, led by Eastern team magnates still smarting from Stearns’ absorption of the Buffalo franchise, then reneged on away-game gate receipt concessions accorded Detroit a year earlier. Unable to balance a payroll loaded with stars, the Wolverines slipped into red ink. Nor was Bill Watkins a happy man. Club president Stearns’ failure to mention the Watkins name in a lengthy banquet tribute to the world champions had bruised the manager’s feelings.17 Then Watkins got into a nasty public dust-up with the revered Deacon White. The specifics of the dispute are murky but its nature can probably be inferred from the mea culpa that Detroit club directors extracted from Watkins: “Some of the statements made in the public press, alleged by [White] to have been made by me, I have never authorized. Other things I have said thoughtlessly, but with no malicious intent toward White. They were made on the spur of the moment and without consideration of their consequences or of the effects the remarks would have upon his feelings. … Realizing now that I have undoubtedly wounded his personal feeling by public expression, I now take occasion to repair the damage as far as possible.”18 This opaque non-apology did little to mollify White. Nor did it repair the strained relations that now existed between Watkins and his employers. 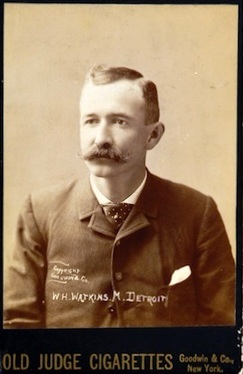 With restive charges underperforming on the field and feeling besieged on all sides, Watkins resigned as Detroit manager in late August 1888, leaving the Wolverines (49-44) in the middle of the pack. Replaced at the helm by Bob Leadley, Watkins had posted an excellent 238-153 (.609) log, with a recent world baseball championship to his credit, during his term as Wolverines overseer. The Detroit Wolverines would soon exit the scene, as well. The wealthy Stearns, his ambitions satisfied by the 1887 championship, had relinquished control of the club to fellow directors. They, in turn, proved unable to bear the burden of financing an unprofitable major-league baseball operation. Accordingly, those now in charge sold off the club’s star players and disbanded the Detroit franchise at the close of the 1888 season. After his departure from Detroit, Bill Watkins did not remain unemployed for long. On September 7, 1888, he assumed the post of manager of the Kansas City Cowboys, the American Association cellar dwellers. As in Detroit, manager Watkins’ duties were mainly in the front office, not on the bench. But lacking the fiscal resources once supplied by Stearns, Watkins was unable to duplicate his earlier success. The 1889 Cowboys finished a noncompetitive (55-82) seventh place in AA standings and the franchise was dissolved shortly thereafter. With the newly formed Players League taking the field for the 1890 season, baseball again saw the major leagues inflated into three separate circuits. Despite that, Watkins appears to have remained away from the game until the following year, when he took the reins of the lackluster St. Paul (Minnesota) Apostles of the minor-league Western Association.19 With the club anchored in last place at 17-34, the franchise was shifted northward to Duluth, and thereafter disbanded on August 20, 1891. By then, however, Watkins had been supplanted as manager by Jay Anderson. Although minor-league reference works are in conflict,20 it appears that Watkins spent at least part of the 1892 season as manager of the Rochester Flour Cities of the Eastern League. The following year, he resurfaced in the majors, becoming the latest in the parade of baseball men installed as manager of the once-proud St. Louis Browns by madcap owner Chris von der Ahe. Watkins, however, had no more success at the Browns’ helm than his most immediate predecessors and was dismissed after a tenth-place (57-75) St. Louis finish in a National League now swollen to 12 teams. In 1894 Watkins became manager of the Sioux City Cornhuskers, an entry in the latest version of the Western League. With a lineup jammed with .300 hitters and a pitching staff headed by 35-game winner Bert Cunningham, the 74-52 Cornhuskers captured the Western League pennant for manager Watkins. The following season, the Cornhuskers were removed to St. Paul by incoming club owner Charles Comiskey. But Watkins did not accompany the team. Rather, he signed on as manager of a Western League rival, the Indianapolis Hoosiers, a move that in time would place Watkins in the middle of a skirmish between the two executive giants of turn-of-the-century baseball, Ban Johnson and John T. Brush. Originally a Cincinnati sportswriter, Johnson had assumed the presidency of the Western League upon its re-formation in October 1893. Able and energetic, Johnson soon transformed the new circuit into a premier minor league. Throughout its early existence, however, the Western League was nagged by the problem of competitive imbalance, a situation largely attributable to the maneuvers of Brush, the owner of the Western League’s Indianapolis Hoosiers. By now, Brush was also president and majority owner of the National League Cincinnati Reds,21 whose roster Brush manipulated ruthlessly to Indianapolis’s advantage, fortifying the Hoosiers’ lineup for crucial games against Western League rivals with Reds players, at times optioned to Indianapolis for no more than a weekend and then recalled to Cincinnati. With big-league ringers at his disposal, Watkins managed Indianapolis to Western League pennants in 1895 and 1897, while his 1896 nine finished a solid second. By 1898 the complaints of fellow club owners had precipitated enactment of a prohibition against simultaneous ownership of a major- and minor-league baseball team, forcing Brush to relinquish (at least on paper) control of the Indianapolis club. By then, however, Bill Watkins had moved on, returning to the majors as pilot of the National League Pittsburgh Pirates. In Pittsburgh, as elsewhere – with the notable exception of Detroit – Watkins was well liked, age and experience having greatly moderated his once-biting tongue. But sadly for Watkins, he got to Pittsburgh too soon, his installation as manager predating the arrival of Honus Wagner, Tommy Leach, Deacon Phillippe, Sam Leever, and the other Pirate stalwarts who would shortly make Pittsburgh the class of the National League. Saddled with mediocrities, Watkins guided the Pirates to an eighth-place (72-76) finish in 1898. The following season, the Pirates started 7-15, and Watkins resigned. Although his baseball career would continue for another two decades, Bill Watkins’ days as a major-league manager were now over. In five different locales, Indianapolis (1884: 4-18); Detroit (1885-1888: 238-153); Kansas City (1888-1889: 58-93); St. Louis (1893: 57-75), and Pittsburgh (1898-1899: 79-91), Watkins-led clubs had posted a 436-430 regular-season log,22 while taking 10 of the 15 postseason games that gave Detroit the 1887 world championship. In 1900 Watkins returned to Indianapolis, where he resumed command of the Hoosiers, now a member of the American League, the new moniker bestowed on the Western League by Ban Johnson in anticipation of declaring his circuit a major league in 1901. A prudent conservator of his own resources, Watkins now had the financial wherewithal to assume majority ownership of the Indianapolis club as well (although suspicions lingered that Watkins was no more than a front man for his friend and former employer Brush).23 That 1900 season, owner-manager Watkins led the Hoosiers to a third-place (71-64) finish in the American League. In the ensuing offseason, Watkins became embroiled in a new and far more momentous clash between Ban Johnson and John T. Brush – the battle over the establishment of a second major league in baseball. These developments left Bill Watkins the owner of a professional baseball team with no league to play in. Scrambling, he secured a berth for Indianapolis in the Western Association, a second-tier minor league. The caliber of Western Association play proved unacceptable to Indianapolis fans, only 400 of whom would attend a typical Hoosiers game. In mid-July Watkins sold the club to new owners who removed the franchise to obscure Matthews, Indiana to complete the season. But a brighter baseball future for Watkins and Indianapolis was on the horizon. In November 1901 an Indianapolis club newly assembled by Watkins joined one-time major-league cities like Louisville, Milwaukee, Kansas City, Columbus, and Toledo, plus St. Paul and Minneapolis, to form the minor-league American Association, destined to become one of baseball’s most stable professional circuits. Laced with major-league material like outfielder George Hogriever (a league-leading 124 runs scored) and pitchers Win Kellum (25-10), Jack Sutthoff (24-13), and Frank Killen (16-6), Watkins, fully exercising the duties now commonly associated with being a baseball team manager (in addition to being club owner and president), guided the Indianapolis Indians to the maiden American Association pennant, its 96-45 final season mark good for a two-game margin over Louisville.26 The following season, however, Indianapolis dropped to fourth place (78-61) and placed dead last in home attendance (88,000) among AA clubs. This prompted Watkins’ resignation as Indianapolis club president and manager to take over the reins of league rival Minneapolis. After two also-ran campaigns with the Millers, Watkins sold the Minneapolis franchise to former St. Paul manager Mike Kelley for a reported $25,000 in December 1905. But Bill Watkins was far from through with baseball. In 1906 he reacquired the Indianapolis franchise, reinstalling himself as the Indians’ president and manager. This time, however, on-field success eluded him as a field skipper. With Indianapolis headed for last place, Watkins resigned as manager, tapping first baseman Charlie Carr to preside over the club’s 53-96 finish. For the next five years, Watkins confined himself to front-office duties for the Indians, reveling in the 1908 pennant brought in by manager Carr behind the exploits of future major-league standouts Rube Marquard and Donie Bush.27 Thereafter, disputes with front-office subordinates soured Watkins on Indians baseball. On May 23, 1912, Watkins, now approaching his 54th birthday, resigned as Indianapolis club president and sold the team, returning home to Port Huron to tend to his farm and business interests. Two years later, however, Watkins returned to Indianapolis to assume the post of general manager/business manager for the Federal League Hoosierfeds, the eighth and final time that he would serve a professional baseball organization seated in the Indiana capital. The Federal League crown captured by the 1914 Indianapolis club was the sixth pennant winner that Bill Watkins would be associated with. It was also his last. Watkins resigned his position with the organization when the Indianapolis franchise was transferred to Newark for the 1915 season. Once again he returned to Port Huron to attend to his interests there, his 30-year involvement in professional baseball seemingly at its end. Back home, Watkins immersed himself in local business affairs, serving in executive positions at various Port Huron banks, land-development companies, and manufacturing concerns, and as president of the Port Huron Chamber of Commerce. A naturalized American citizen since 1897, he was also active in civic matters, particularly after taking up residence in Marysville, a fledgling nearby community that he helped to establish.28 In 1919 Watkins served as the first president of the village of Marysville, and thereafter chaired the committee that upgraded its municipal status to that of a city. Simultaneously, Watkins maintained his interest in baseball. He declined an offer to return as Indianapolis Indians manager in 1918,29 but took keen interest in the local game. He was a financial backer of the Port Huron Saints of the Class B Michigan-Ontario League, and served as club president in 1921-1922. In appreciation for his support, Saints home games and those of the local high school were played at a downtown Port Huron field named in Watkins’ honor. Watkins remained a leading citizen of his new hometown, even at an advancing age. He served on the Marysville Board of Education for ten years and was elected justice of the peace in November 1933. In early 1937, Watkins’ health began to fail. Hospitalized for a month in Port Huron, he died there of diabetes complications on June 9, 1937, at the age of 79. After a service at Grace Episcopal Church, Watkins was interred at Lakeside Cemetery in Port Huron. Without children, he was survived by his wife, Edna, and sisters Mary Ella Watkins Crisp and Lily Watkins Shilton. In the ensuing years, Bill Watkins slowly faded from collective consciousness. Watkins Field was razed in the early 1940s and area residents who knew him personally passed away. Decades later, however, the research of minor-league historian Marc Okkonen brought the Watkins legacy back to local attention. And in October 2008, long-deceased William Henry Watkins was inducted into the Port Huron Sports Hall of Fame,30 a modest but apt testimonial to a bygone but well-spent life. 1 The biographical profile of Bill Watkins and family is drawn primarily from material furnished the writer by reference librarian Barbara King of the St. Clair (Michigan) County Library system and local history librarian Denise Kirk of the Brantford (Ontario) Public Library. US Census data accessed via http://www.ancestry.com were also utilized. Watkins’ siblings were younger sisters Mary Ella (born 1860) and Lily, born 1862. 2 John Harton Watkins promptly remarried, taking Alice Hoyle as his second wife in 1869. Why son Bill remained thereafter in the care of his grandparents is unknown. 3 Watkins’ obituary in the Port Huron (Michigan) Times Herald, June 10, 1937. 4 Port Huron and nearby Michigan communities (including Marysville) are separated from Ontario by the St. Clair River. 5 Sources including Baseball-Reference.com designate Watkins as a right-handed batter, with his throwing arm listed as “unknown.” By the mid-1880s, however, left-handed infielders had become a rarity. 6 Sporting Life, August 20, 1884. 7 In obituaries and memorials it was reported that the Shallix beaning caused Watkins’ hair to turn white overnight. See e.g., The Sporting News, June 17, 1937 (Necrology), and July 8, 1937 (an Edgar Brand column). This piece of Watkins folklore, however, is belied by post-beaning photographs, all of which show Watkins with reddish-brown hair and mustache until he was well into middle age. 8 Uncounted in the Watkins managerial log, and the 1884 Indianapolis record as a whole, is a 10-10 tie game with Virginia (Richmond) on September 20. 10 The Sporting News’ founder, Al Spink, was convinced that Watkins had tried to break up the hometown Maroons, an offense that Watkins later compounded via an unintentional snub of Spink at a meeting with St. Louis club supporters. 11 In reaction to the Broidy and Weidman sanctions, it was reported that dissension “is rife throughout the [Detroit] club, but Watkins does not have the guts to fine the more prominent malcontents.” Unidentified July 21, 1887, news item contained in the Bill Watkins file in the Giammati Research Center at the National Baseball Hall of Fame in Cooperstown, New York. 12 The Sporting News, October 25, 1886. 13 The Sporting News, December 11 and 18, 1886. 14 The Macon trip permits Watkins to join the legion of claimants to the title of initiator of spring training in the South. 16 Game 14 in Chicago drew only 378 paying spectators. 17 Chicago Tribune, August 28, 1888. 18 Washington Post, March 19, 1888. 19 Baseball-Reference lists Watkins as the second of two St. Paul managers in the 1890 season but provides no further information. The Encyclopedia of Minor League Baseball, 2d ed., 1997, Lloyd Johnson and Miles Wolff, eds., however, lists A.M. Thompson as the sole manager of the last place (37-84) Apostles team of 1890. 20 Baseball-Reference and the Minor League Encyclopedia are also in disagreement regarding Watkins’ activities during the 1892 season. According to the former, Watkins was the third of three managers retained by Rochester of the Eastern League. But the Encyclopedia lists Sam Wise as Rochester manager for the entire 1892 season, an improbability given that Wise started that season playing for the rival Binghamton Bingos. In any event, Watkins’ obituary in the Port Huron Times Herald includes Rochester among the minor-league teams he managed, and 1892 was the only year of Eastern League existence in that particular incarnation. Information supplied to the writer by Rochester baseball expert Priscilla Astifan also supports the conclusion that Watkins managed in Rochester during the 1892 season. 21 Over the bitter protest of Brush, the National League had liquidated his Indianapolis club in preparation for the Players League war of 1890. Brush, however, retained his seat on the NL owners council and was promised the next vacant franchise available, which, in 1891, turned out to be Cincinnati. 22 The writer’s calculation of the Watkins major-league managing record is at variance with that of Baseball-Reference, which puts his log at 452-444. 23 Wily, iron-willed, and deeply attached to his adopted hometown of Indianapolis, Brush was widely suspected of trying to circumvent the prohibition on dual club ownership via transfer of title to the Hoosiers club to surrogates, like his second wife, Elsie, or his friend Bill Watkins. In time, however, the bona fides of Watkins’ ownership (with minority interest partner Charles Ruschaupt) of the Indianapolis franchise became evident. 24 Washington Post, January 15, 1901. 25 Sporting Life, March 9 and 16, 1901. 26 More than a century later, baseball historians Bill Weiss and Marshall Wright rated the 1902 Indianapolis Indians 27th in their ranking of the 100 top teams in minor-league baseball history. See http://www.mib.com/mib/history/top100.jsp?idx=27. 27 Baseball-Reference’s minor league managing record for Bill Watkins lists him as one of several managers of the 1911 Huntsville Westerns of the Class D Southeastern League, but this is demonstrably incorrect. Among other places, Watkins’ retention of his posts in Indianapolis during the 1911 season is attested by correspondence contained in the Garry Herrmann file at the Giammati Research Center. Various 1911 missives to Herrmann bear Watkins’ signature and appear on stationery with a letterhead that reads: “W.H. Watkins, President, Indianapolis Athletic Association,” the corporate name of the Indianapolis Indians franchise. 28 See Watkins’ obituary in the Port Huron Times Herald, June 10, 1937. 29 Washington Post, February 21, 1918. 30 Port Huron Times Herald, October 24, 2008.